As one does more and more inspection of climate stations, they fine that most manufacturers build a series of stations that are very similar to each other. You will also find while they appear very much alike, if you look much closer you can find some very interesting differences. 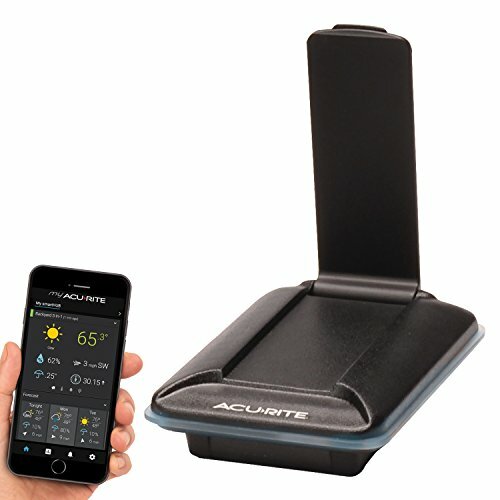 The AcuRite 01512 Pro Color Weather Station is similar to others we have reviewed but please allow us, to point out to you the additional features this model has for the weather lover in you. We believe you will be intrigued as well as impressed with the AcuRite 01512 as you read this review. We were excited about the extra features this model offers you. If you are more than a casual observer of the daily elements, we believe you will be as equally as impressed as we were. It is our belief that people such as serious gardeners, small farmers, serious weather hobbyist, and people who love to keep historical data records of daily instruments, will be very interested in this product. Keep reading if this is you, allow us to help you save time guide you in your buying decision. We are concerned about the solar sensor getting enough energy to operate the fan properly. When placing this remote unit, be aware you need to collect enough sun to operate the aspirating fan, but not too much sun to cause too much heat build up inside the unit. This could cause the fan to not be able to keep up with keeping the temperature down enough to get a proper temperature reading. We view this as a Catch-22 type situation. The sensors that are housed in the outdoor unit are the thermometer sensors, the anemometer, the barometric sensor, the rain gauge and the relative humidity sensor. As you read through our review of the AcuRite 01512, please look for our mention of our other articles that can be used as supplements to this review. Such things as sensor placement are extremely important to successfully using your weather station. Please remember that it is very important to study out our information on where to set up your location for the remote display. You must read this great post on mounting your remote sensors for remote sensor locating, both how and where to do it. This is a list of display provided alert indicators that we really liked. Many of these are not part of lessor expensive models from AcuRite, but are part of this model. Wind Speed Alert indicator-activates when the wind speed is over 50 mph. As you can see, these cover a variety of related areas, that any big fan of climate elements would find very useful to them. Being a big fan and an active weather station user, I would find the storm alert indicator to be great, for those busy days where you kind of forget about the weather. A bad weather storm alert would definitely save your back side. I believe my other favorite, is the rain alert, which can really help you prepare for any possible flooding. You can be aware that it is raining a lot, but this alert would be like your own possible flood warning alert. Preventing flood damage could save you thousands of dollars. Very cool indeed. For a good insightful look at how the display unit is set up, and some of the common features between this and the AcuRite 01036 go here to read this information. The two models are very similar on many areas. The backlighting on the display is a very popular with this model. We love being able to see the display clearly at all angles. The larger size, the brilliant colors and the backlighting make this model a winner. Many high marks to AcuRite for their design. Here is some information for you. High (100%) brightness, Medium (60%) brightness and Low (30%) brightness. While it is wonderful to give you these settings, one complaint you need to be aware of, is that the backlighting (at night) can be too bright for some customers. When the brightness is even set at 30%, it is still very bright for the likeness of some owners. When the display is only on battery power, the display setting backlight is only on for ten seconds. We don’t believe this isn’t long enough to digest everything displayed to view. Many customer complaints bear this out to be true. We think you would like for the backlight to be on longer than only ten seconds when you hit the backlight button. We believe this is to conserve battery power when using. It is our believe as well that reaching for the backlight button every time is a possible irritant to some, and to others, Well they just wouldn’t put up with this at all. As I wrote this review I came across this very interesting tid bit, did you know this about the rainfall information collected? Rainfall tracking on the 01512, is done by the remote sensor & display unit in unison. This station also features enhanced tracking of historical rainfall data. Rain accumulation data is recorded for today, all time (over all) accumulation figures, measurements for the year, the monthly rainfall totals, and then a one time rainfall event amount measure. A really neat thing about this AcuRite model, is that it has the trade-marked Weather Ticker feature. This is the continuous flow of information that runs along the bottom of your (in home) display unit. and alerts as text in the lower part of the display screen. Here is the list of messages that can be shown. It is my concern that you can’t change any part of this. Say as an example, maybe you don’t want all of this information showing all the time. Can you edit or delete some of the information titles if you don’t want that information? The answer is that you can’t edit the Ticker at all. Here are the accuracy ratings for the display unit. Now let’s take a look at the remote sensor and outdoor ratings. The software for the AcuRite 01520 will have to be purchased outside of what comes with this station. The remote sensor transmits data regularly to the display station inside. That is the extent of software that is involved with this model. Anything else you will need to make an outside purchase. The AcuRite 09150 AcuLink Internet Bridge is what is recommended to work with your data stream’s transmission to the display unit in your house. With this AcuLink Internet Bridge you are able to do several things. You can remotely monitor information from your station unit. Very important to note that you will need to have an ethernet cable so that you may connect it directly into the internet connection you have. The internet needs to be hooked into the bridge 24/7, this is very important. The data may also be shared with weather sharing communities like Weather Underground. When using the bridge, you can also share your information with other users of Aculink.com.acurite-01512. You can set up email and text alerts when any changes have activated the alerts on your station’s display. There isn’t a fee for these bridge provided services. No monthly fees ever! Support for AcuRite products is readily available at the following. Display uses a 4.5V power adapter, which is included in your purchase. Using the power cord adapter is recommended for optimal display color. The display unit also uses 6 “AA” alkaline batteries. Not necessary but optional, and note as well that batteries are not included by manufacturer. The power brick is approximately 1 1/4″ x 2 1/2 and sticks out about 1 1/2” from the wall. The power cord is also around 6 foot long. 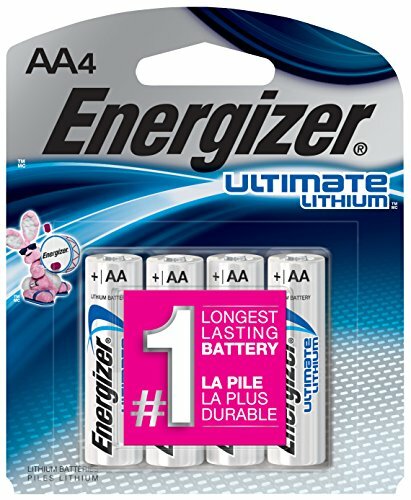 Remote sensor uses 4 “AA” alkaline batteries or if you choose, Lithium batteries. 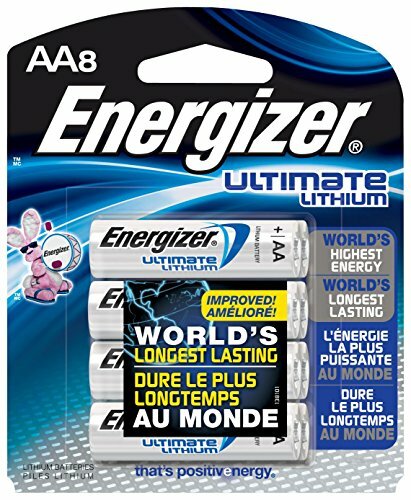 In colder climates it is highly recommended that you would use the lithium batteries. Lithium batteries work much better in colder climates. They also hold their power charge much longer than a conventional battery would. This will allow you to spend less time changing the batteries, as well as less expense in the long run. As I spent time digesting all of the information on the AcuRite 01512 model, I was amazed at the similarities to the other model I have reviewed. This unit possesses all the great things that we loved about that display. This model has additional bells and whistles. The added alerts, the added information provided on the weather ticker, plus the automatic emptying rain gauge more than make up for the additional cost of the unit. They add for added interest and fun in using this station. We believe that this unit deserves a 4.5 star rating from us. It has all the AcuRite features, and a big plus on the features. Now there is so much more information being provided. more to record, more to track, more to help you with understanding your daily climate elements. The amazingly strong overall ratings are backed up by our research. This is a very solid station for the avid fan of daily climate elements. So if you consider yourself, a geek, an avid fan, an enthusiastic participant, or a long time admirer, we believe you would be very satisfied with this model. But if you find yourself as a casual observer, a hurried seeker of daily weather information, or even, just a person who may need information for occasional special events. If that is you, you would be wasting your money on this unit. You would be receiving way too many things to look at, too many things you don’t care about, or you just want a couple simple things provided. In a nutshell a very solid choice for the informed person, who has a need for much information. We like to study and analyze this would be very enjoyable to us. This AcuRite 01512, is very reasonably priced for the consumer. After looking at all of the features this model offers, I find that this would be a highly recommended purchase for the serious weather fan. I am talking about the person, who loves to look at what is going on outside all the time. Many people talk about the daily weather in passing. Many do it as a topic of conversation, usually because they have nothing else to talk about. That is not the person I am talking about. I am referring to the person who loves to look at temperature data, wind speeds, and barometric pressure readings. The person, who keeps daily records of all types of instrument readings. The person who will spend ten minutes analyzing a weather report. That is me. If that is you, you will love the AcuRite 01512. But if you are looking for a display unit that provides time, temperature, a future forecast, and maybe the wind speed this model is not for you. The cost for all of the features wouldn’t be worth it to you. You do not need all of that information, nor would you ever use it. We can recommend other stations for you that are much simpler, and very easy to use, plus they would be exactly what you were looking for at the price you would be fine with spending money for. These are two well received models we could recommend for the casual weather observer. If you are the avid information seeker, and love to study wind speeds, wind directions, and find your self stuck looking at bad weather events, then you will very pleased with the AcuRite 01512 as a choice to purchase. Get the weather forecast and temperature information to plan your day with confidence with AcuRite’s Pro Color Weather Station. Its high precision 5-in-1 weather sensor accurately measures five different conditions, including: the temperature, humidity, wind speed, wind direction and rainfall giving you easy-to-understand, comprehensive data about the elements right outside your door. The weather center’s illuminated color LCD screen features weather conditions for your exact location, indoor and outdoor temperature and humidity, daily and all-time high and low records, wind speed, wind direction, heat index, dew point and wind chill, rainfall tracking by day, month, year and over all-time, barometric pressure, a weather ticker that streams real-time data including moon phase, indoor comfort level, feels like temperature, and more. The 5-in-1 Sensor is easy to setup! includes mounting hardware and features a 2 year battery life for maintenance-free operation. 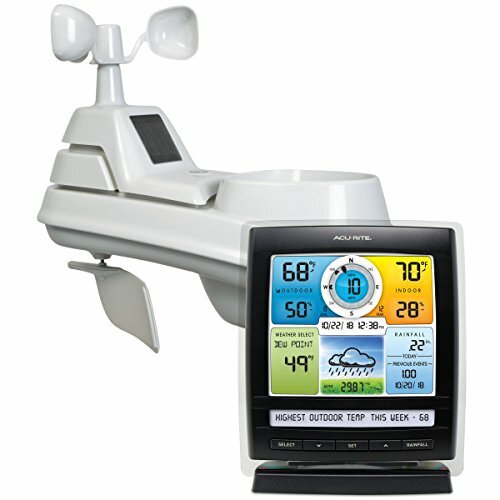 Plan your outdoor activities with confidence with AcuRite’s Pro Color Weather Station. 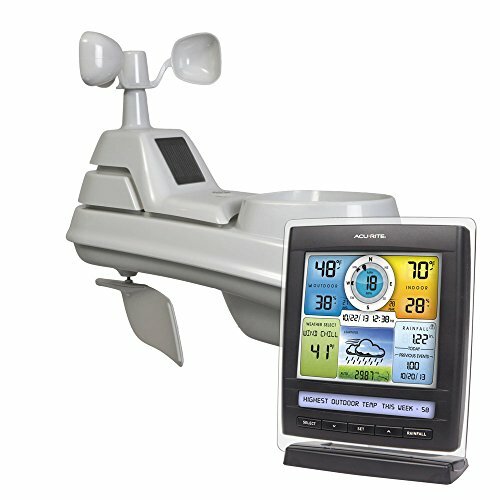 AcuRite 01512 Pro Color Weather Station is reviewed. A terrific review where we discuss the pros and cons of this weather station. Many other areas are looked at as well.